InPro® THF and InPro® THF2 are vertical via filling processes using insoluble anodes for best plating uniformity in vertical equipment. Both are designed for use in DC mode with sparger agitation and external copper replenishment. The InPro® THF series enables optimal TH and BMV filling in panel and pattern mode. InPro® THF is the mass production proven standard for mSAP production at high current densities (up to 3 A/dm²) as well as for LTH filling. All standard reliability tests are passed even at highest current densities, so that InPro® THF can be used to increase the productivity of your existing VCPs. InPro® THF2 is the next generation process that offer increased filling capabilities, a higher ductility, improved uniformity and a wider working window. BMV and TH filling in pattern plating mode with minimum dimple is a standard requirement for IC Substrates and (a)mSAP production. Increasing demands for uniformity need a good within-unit distribution as well. 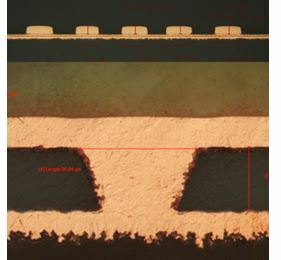 To meet your process and productivity targets the required filling processes must provide a minimum of surface plated copper and excellent within-unit distribution at highest possible current densities. InPro® THF and InPro® THF2 are Atotech’s answer to increasing productivity demands. Both provide reliable BMV filling in VCPs up to 3 A/dm² for (a)mSAP production. 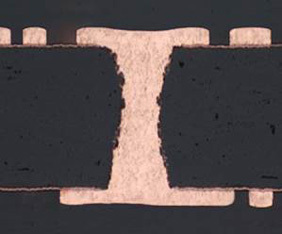 They have been developed in order to fulfill the current and future IC Substrate market requirements for fine line pattern plating, granting minimum surface plated copper via filling whilst giving optimum within-unit distribution. Our InPro® THF series will boost your productivity while keeping the required reliability characteristics.